The Clarion-Ledger reports that Bertha Vickers of Morgantown was having a tough season. She’d been seeing deer, but couldn’t close the deal. 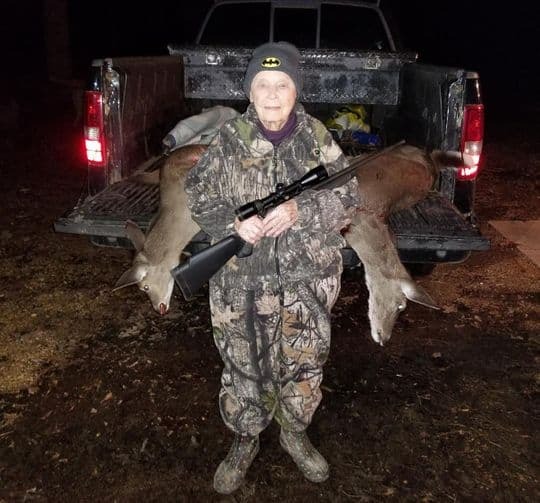 Vickers celebrated turning 101 and was back in her hunting blind, hoping for a chance. She spotted a small doe. “I decided to wait for a bigger one,” Vickers said. “Before long, a bigger doe came out and I shot. Read the full story to see what happened next. Bertha’s grandson skinned the deer, and she helped cut it up. Thats such an awesome story Bertha! My goal when I retire is to hunt as hard as I can for as long as I can. I always thought that hunting successfully into my 70s would be wonderful but now the sky is the limit! Great job!